Size: Adult female--1/8", adult male--1/2"
Identification: Females and nymphs are found on the pods of prickly pear cacti under the waxy cotton produced by the insects for protection. Biology and Life Cycle: Incomplete metamorphosis. Only males develop wings. Habitat: Desert and arid areas. Prickly pear cacti. Feeding Habits: Juices of cacti, especially prickly pear. Economic Importance: Juice (body fluid or blood) from the bugs is used as a beautiful red dye. Insight: Clusters of cochineal bugs often feed side by side, covering large areas of prickly pear like a white furry rug. American Indians used this juice to make a crimson dye. 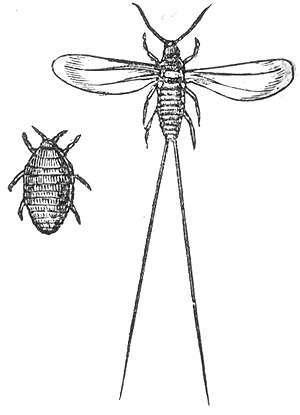 Old drug stores used to sell bottles of cochineal bugs for use as a dye. About 70,000 insects are needed to make a pound of the dye. Cochineal is also used as a food coloring (especially in cake coloring) and permanent dye; it is an ingredient in many beverages, cosmetics, and medicines.